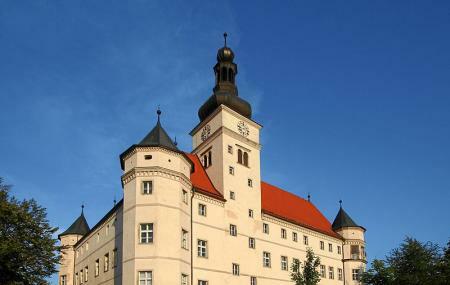 Find hotel near Hartheim Castle Memorial .. The Hartheim Castle Memorial Site is one of the most important memorial sites in all of Austria. It was built in 1600 by Jakob von Aspen, but is famous for being one of the notorious Nazi Euthanasia killing centers. The castle has gone from one to another several times and by 1862, had become wrecked. The current castle is the works of Camillo Henry, Prince of Starhemberg. After the castle turning into the euthanasia center, between 1940 and 1944, approximately 18,000 people with physical and/or mental disabilities were killed here. Today, the castle stands as a memorial site dedicated to these victims. Want to plan a DIY trip? Use Alkoven trip planner for the same. You can add cozy hotels in Alkoven like Hotel Kolping, Courtyard By Marriott Linz, Hotel Zum Schwarzen BÃÃÃ‚ƒÂ¤ren and Hotel Prielmayerhof. Explore the best Alkoven vacation packages that will take to you important landmarks of the city! For getting in, check out how to reach Alkoven. Love this? Explore the entire list of places to visit in Alkoven before you plan your trip. Fancy a good night's sleep after a tiring day? Check out where to stay in Alkoven and book an accommodation of your choice. It's a very profound experience, there is little to remind you of the horror that occurred there to the innocent people from the surrounding area and southern Germany. There was strong resistance to what was happening here and those that protested disappeared as a warning to everyone else . Tours and conferences are arranged to those that are interested or as part of the local education experience. It's a credit to the Austrian people that their education includes the mistakes of the past in order to prevent such horrors in the future. It is eerie how serene and almost majestic this castle looks given the heinous crimes that the Nazis perpetrated here. For those unfamilar, this was one of the sites where the Nazis "euthanized" mentally ill and disabled Germans and Austrians. After learning about the process and murders committed here it is fitting to turn the corner to the modern day - the cafe is staffed by mentally ill and disabled persons. Support their efforts and the positive that is now helping the types of people murdered here. There is a clarification that I would like to make. Hartheim Castle was a place where not only Germans and Austrians were murdered but in very large numbers also citizens of Poland. Among them my Uncle, Polish man. He was first in Mauthausen Gusen Concentration Camp then later transported to Hartheim Castle and murdered. To my knowledge Hartheim Castle was the last place for many man of many nations. Over 30 thousands people was murdered there. I was`t there yet but to publish my clarification it was a must to rate it. I will visit there this year. Very beautiful castle that has a terrible history. Worth visiting.